Show cooking in front of guests with a licence to breathe freely. 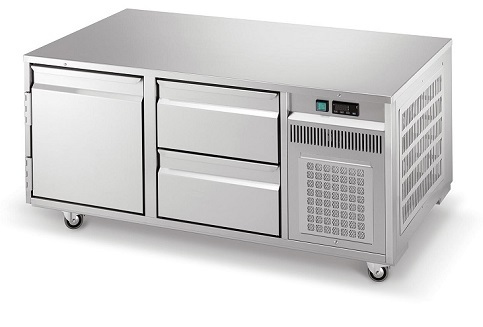 Please use our configurator system and create your own personal BLANCO COOK. Fronts and sides can be designed in different colors. Give yourself the latest technology in timeless design, choose your own combination of front cooking station and cooking appliances - modern and functional by BLANCO COOK. Beautiful variety and simplified handling. Optionally, you can equip your new BLANCO COOK front cooking station with a colored panel of powder coated sheet in 13 new BLANCO colors. Fronts and sides can be designed in different colors. Alternatively, the front can also be coated with Resopal laminate in "Plain Colors" or "Woodgrains" in many other colors. The panels are easy to fit and can be replaced at any time - to suit your rooms, your color concept, your motto. 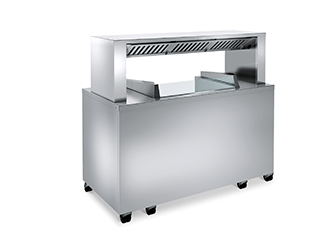 Easy driving instead of heavy carrying - with the mobile placement table, transport and changing of your table-top cooking units become easy. The placement table can be retrofitted at any time. The depicted shelf is available as an option and can be easily attached without the need for any screws. 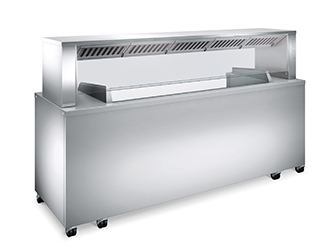 Available for 2, 3 or 4 table-top units and suitable for all BLANCO COOK front cooking stations. 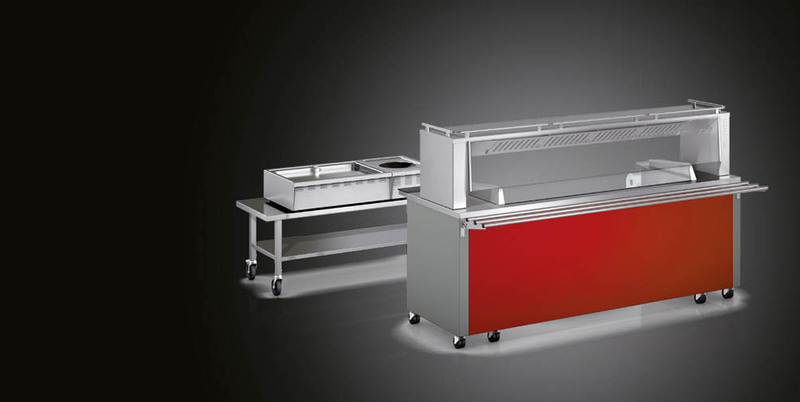 The mobile placement table is simply inserted into the BLANCO COOK front cooking station with the table-top units and the show cooking is already starting. Vacuum and a three-sided air stream guide the fumes to the extraction bridge. In the extraction bridge the grease is separated. Fleece and grease filters absorb moisture and aerosols. 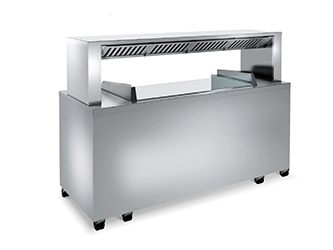 Odour particles and blue smoke are reduced with the optional ION TEC filter system. Activated charcoal binds odour molecules. The cleaned air exits downward. The filter system ION TEC filters blue smoke and prolongs the service life of the activated carbon. In the pre-filter stages coarse particles, e.g. Grease separated. 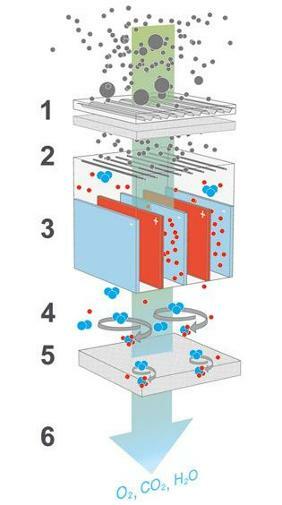 In the ionizer, the particles flowing through are positively charged by an electrostatic voltage field. In addition, high-reactivity ozone is formed from oxygen. In the collector stage, the positively charged particles adhere to the negatively charged plates and are thus deposited (especially aerosols). 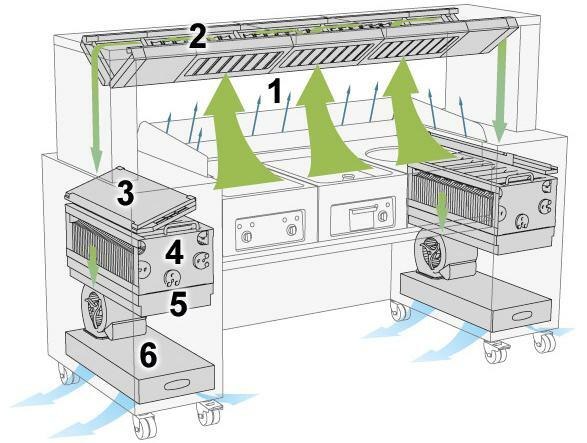 In the oxidation process, the ozone decomposes odors and blue smoke. Particles attached to activated carbon, which have not yet been deposited, react with the residual ozone. The activated charcoal is thereby cleaned, the service life thereby significantly extended. Oxygen, carbon dioxide and water are released as end products to the environment. With the 13 carefully selected colours by BLANCO Professional, you can bring a breath of fresh air to everyday life and make the special things even more attractive.